Brandon Twp.- Barb VanderMolen was 11-years-old when the Mackinac Bridge was built and remembers thinking she would never see it. Born and raised in Wayne County, the daughter of a Teamsters truck driver who worked every Saturday, and a mother who didn’t drive, the family had no disposable income and she never traveled. She was a junior in college before she ever saw Lake Michigan. It wasn’t until she married a man employed by a farmer’s association and moved to Eaton County that she developed wanderlust. Now the 69-year-old has traveled to every county in Michigan and written a book, “Discovering Michigan County by County,” which she will discuss during a free presentation from 6-7 p.m., April 19, at the library, 304 South St., Ortonville. The book will also be available for sale. The book was nine years in the making, and VanderMolen’s travel guide was first published in 2012 and republished in 2014. 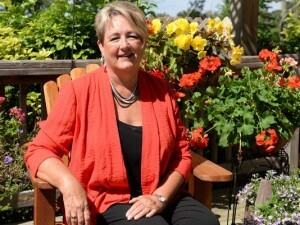 She estimates she put 5,000 to 6,000 hour into writing the book that has 83 chapters, one one each county in the state. The chapters are further broken down into alphabetical categories, from A for agriculture to Z for zoos and animal places. “That is how we tell the story— with 90 references per chapter to pull it all together,” said VanderMolen. “There is no other book or website where you can find all this information at your fingertips.”Her inspiration for the book came after she was a guide for bus tours in Lansing during the 1990s. The job gave her practice in research. When the bus tour business crashed following the decline in traveling after the terrorist attacks of Sept. 11, she found her new vocation— writing the book. She made sure she made a stop in all counties she had not yet visited. She laughs as she says her favorite county is any county with water. In the book, she notes that Oakland is the wealthiest county in the state and also number one in the sale price of horses. VanderMolen enjoys driving through small towns. Tuesday will be her first visit to Ortonville. To register for the free library program, “Discovering Michigan County by County,” call 248-627-1461 or visit www.brandonlibrary.org. 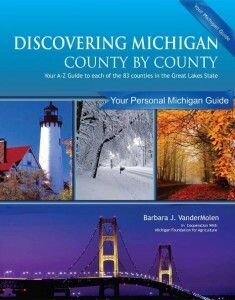 For more information on the book, visit DiscoverMichiganCountyByCounty.com. Current State’s Scott Pohl speaks with the author, who says it’s for anyone who likes to explore every nook and cranny of the state. I was born in Detroit after my Dad returned home from WW II. Shortly thereafter my parents moved into a brand new post-war house in Dearborn Heights on a street with the magical name of Silvery Lane, where we lived for the next 24 years. My Dad worked for People’s Outfitting Company, and later Montgomery Ward, delivering furniture. He worked Saturday and had Sunday and Monday off. As I look back now, that was a major defining parameter of our life: we couldn’t go anywhere on a weekend or do anything because my Dad worked Saturday, and nine months of the year my brother and I were in school on Monday. One time we went charter fishing from Port Austin and maybe in the summer we would go to a lake in Oakland County. Once a summer we would go to a Tigers game if Dad could get free tickets from a neighbor who worked at Ford. We were a one-driver, one-car family, which meant that we didn’t go anywhere if Dad didn’t take us. Disposable income was probably an issue, too, but as a kid you don’t know about things like that. Our summer vacations consisted of going to Indiana and Kentucky to see the family of my parents. Of course it was fun, but it wasn’t going “up north” to such exotic places like Tawas and Traverse City. It wasn’t going to the cottage at the lake or camping in a state park. I was always somewhat envious of kids who were able to go and do those really exciting things. But I was a Girl Scout. My 10 years in Girl Scouts gave me the opportunity to visit the Twin Pines Dairy and the Wonder Bread factory. We took the train to Lansing to visit the Capitol. We visited Windsor. I went to Camp Metamora and the Girl Scout Round-up in Button Bay, Vermont. I knew Michigan was much larger than my limited experience; I wondered, though, if I would ever have the chance to visit all those places I read about in books. Our school district had a marvelous summer recreation program and every Friday we would go to either Camp Dearborn in Milford or Kensington State Park. That meant I had the opportunity to play in a lake. That was important for my identity as a Michiganian. I remember when I was 12-years old when the Mackinac Bridge was finished. It didn’t really matter because I figured I would never see it anyway. I saw my first sunset on Lake Michigan when I was a junior in college, and a spectacular sunset it was. I finally got to see The Bridge and go to Mackinac Island after I was married. So from the little girl who never went anywhere in Michigan, I have now written a comprehensive tour guide of our state, “Discovering Michigan County by County: Your A-Z Guide to Each of the 83 Counties in the Great Lakes State.” I know that every county has a story to tell through its facts, history, land and water, people and things to do. My desire is that every reader would develop an appreciation for all the abundance that God had given our wonderful state. Bottom line: Michigan is a unique and wondrous state to visit even if you don’t start to experience it until you are an adult. To submit an essay about what you love about Michigan and why you choose to live here, contact Anne Erickson at aerickson@lsj.com. Essays should be no longer than 400 words. 8/29/14 Join us on Front Street for casual conversations with local community members, authors, artists and area business owners. (NEWSCHANNEL 3) – If you’ve ever taken a trip somewhere in our great state and had to go through hours of Googling or page through tons of visitors booklets to figure out what to do there, a Michigan woman says she has the solution. Alex Jokich met up with the dedicated Michigander who spent nine years sifting through thousands of sources to create a county-by-county guide in the video report.